And we have a preliminary cover design for Album 56: The Grand Design. At this point, it is only a fan rendering closely based on the small teaser revealed in Adventures in Odyssey’s Social Shout-Out #4. You can see a larger resolution of the (not final) cover at our product page. 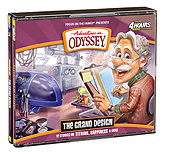 It’s interesting to note that album versions appear to be changing with the release of Adventures in Odyssey album downloads in recent years. If you purchased the download version of The Deep End when it was released late February, no doubt a special audio bonus feature was included highlighting behind-the-scenes information (and fun, too!). However, if you recently received your hard copy of the album, you didn’t get the added bonus feature included with the album download (and many of us look forward to those behind-the-scenes moments as albums are released). Hard copy purchasers, if you’re looking forward to audio bonus features from here on out, it looks like you might have to purchase both the download and the physical copy to have the benefits of both. Of course, we’ll confirm this news this as time progresses. I’m sure many Odyssey fans are going to be a little disappointed that their hard copies of Album 55 do not include a bonus feature that is only available with the download only. Is this something that you, as a fan, think should happen? Be sure to write to Adventures in Odyssey directly to share your thoughts and/or concerns … or feel free to comment below. We understand that there’s nothing quite like having a physical AIO library rather than a digital one on a computer. Many fans (like me) have both a hard copy of the entire series, as well as a complete digital library. Will we see a day when only digital versions of upcoming albums are released? Stay tuned.